Constrictive reflux and corresponding symptoms of congestion in the area of the vena cava superior. Face gaunt, throat broadened, region of the thyroid glands raised up. 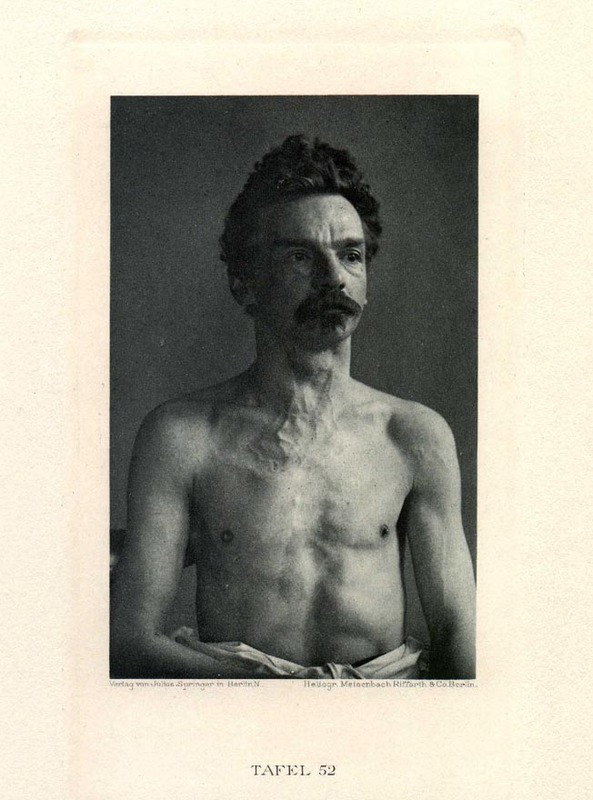 A heavy protruding densely packed network of veins over the front lower throat and upper chest region , in connection with exceedingly profuse veins of the upper shoulder bone region, and of the upper arm on down to the forearms. The lower chest and abdominal regions as well as the legs were completely free of signs of constricting venous reflux. A form of palsy of the vocal chords developed corresponding to the pressure of the tumor on the left n. recurrens. Pressure and tumescence of a carcinomatous lymph gland along the right plexus brachialis have produced violent proprioceptive symptoms (radiant pain and spasms),and paresis of the right arm thereafter. 42 year old prison supervisor. Cause of the disease unknown. Beginning with pains in the region of the manubrium sterni, which radiated out from behind the upper chest vertebrae. Sectioning out, made under difficult circumstances. The neoplast was coming out from the anterior surface of the manubr. sterni, while the thyroid glands had remained clear.